I have a custom context that I want to route some internal calls based on the Outbound CID of the extension making the call. Is there a simple solution in place for this already? I don’t need more than a simple dump. I don’t need the dump at all in fact. I had that there to see is said information was already output. It is not. So I asked the question. If I was trying to get a complex channel dumped out I would do more/different. Either way you should be usoing even if empty the parenthetical DumpChan(). outboundcid is an asteriskdb sqlite3 database value. 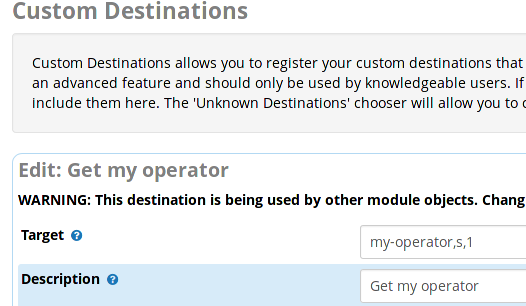 When the user dials ‘0’, route the call to the operator ring group based on the user’s DID area code. Default to ring group 1201. Yes I should probably put more validation in there. I’ve done this in the past for offices with multiple branches, but always based on the extension. because those were clean setups and the extensions were grouped easily in a way to make that possible. always exist in your system? Obviously. Or I wouldn’t set it up. Who said anything about an outbound call. In fact, it is very clearing an internal call.